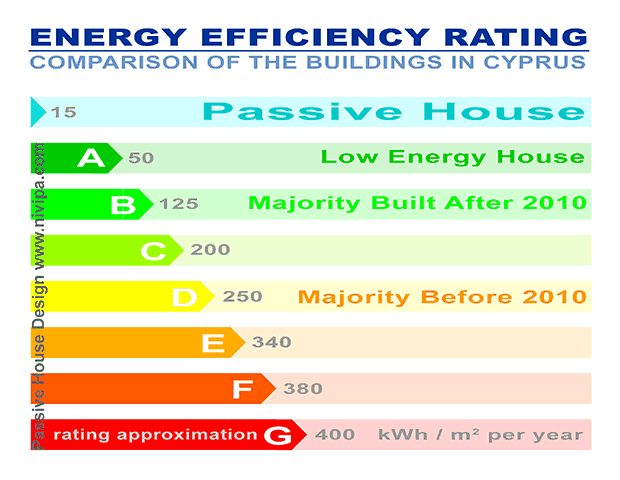 What is the energy efficiency of the Cyprus Passive House? 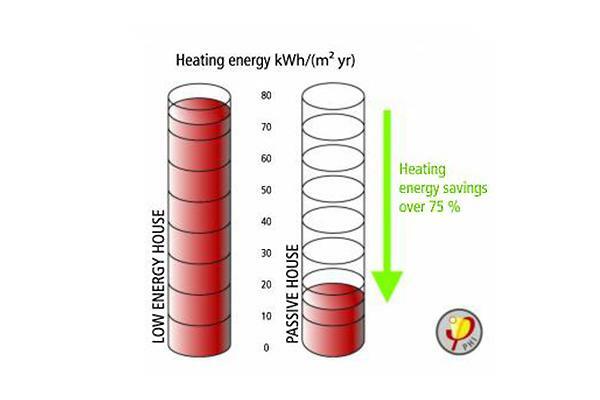 The energy savings in the Cyprus Passive House (Passivhaus) reach 75% compared to low energy houses. Low energy houses are considered buildings that have Energy Performance Certificate indicating energy index “A”. The energy efficiency requirement for the buildings in Cyprus was introduced in 2010. This requirement is only followed for new constructions. Most new constructions have a certificate for energy index “B”. That means they are much less energy efficient than low energy houses with index “A”. Compared to the energy demands of the buildings constructed in Cyprus before 2010, the energy savings of the Cyprus Passive House reach beyond 90%. What is 90% energy savings in Cyprus? Some reports indicate that in order to maintain comfortable temperature inside, the average house in Cyprus has about 200 KiloWatt hours per square meter cooling load at 25°C during the summer and about 80 KiloWatt hours per square meter heating load at 21°C during the winter. The price of electricity in Cyprus in the years 2012-2013 is close to 0.27 Euro per KiloWatt hour, which is the highest in Europe. Using different energy sources can slightly reduce the annual expenses for heating and cooling, but the only way to truly reduce the expenses is to reduce the energy consumption. Considering that the average house in Cyprus has about 200m² of living area and taking into account the current prices of electricity, the possible energy savings in a Cyprus Passive House amount to more than 10 000 Euro annually. In order to achieve such savings a building has to be designed from the very beginning according to the requirements of the Passive House concept (Passivhaus). Nicolaides Viana Partnership holds a Certified Passive House Designer license and as licensed Cyprus architects we can design your house to be a Cyprus Passive House. What about the existing buildings? Existing buildings can reach similar energy savings. After a careful study by a Passive House Designer, they can be retrofitted according to the principles of the Passive House and become Cyprus Passive Houses under the EnerPHit standard.